So often it happens. I buy a golden creamy looking cheese from the grocery store, only to be knocked over by the smell when the wrapping is removed. I usually try a sliver, but I know what’s coming: Yuck-ville—the gag-inducing flavor of smelly feet and body odor. I throw it out (or feed it to Geoff) and wonder where I went wrong. A few months later, I’ll buy a similar cheese without even realizing. Guess I’m a sucker for the golden color. Then I bought this Raw Milk Raclette from Fairway. I opened it up, smelled the tell-tale hint of feet and prepared for the worst. But, with the first cautious bite, I was surprised by the deep complex flavor, not at all foot-like. The cream made it luxuriously heavy, so bits caught in my teeth and the flavor coated my mouth. Every once in a while, a bite of rind would make my nose wrinkle (but in a good way!). This intense cheese pushed my stink tolerance to the limit and I loved it. Next time, I recommend you to melt it and pour it over boiled potatoes. Scrumptious! The wonderful Raclette! My wife (Dr. E.) and I have enjoyed it frequently since discovering it, off all places, on our visit to Iceland. I am told that it is popular in many of the Nordic countries, particularly Switzerland and the Alpine regions. We purchased a device for “melting” the wonderful delicacy, and it is simply delightful on everything from sourdough bread, boiled potato wedges, ham, you name it. Alas, I must say that the Raclette cheese that we have enjoyed, fresh from the country of origin, is SO FAR superior to that purchased (imported) in American supermarkets. But I suppose that may have something to do with the “freshness” factor. GREAT post . . . thank you. I love washed-rind cheeses, but I rarely if ever eat the rind. 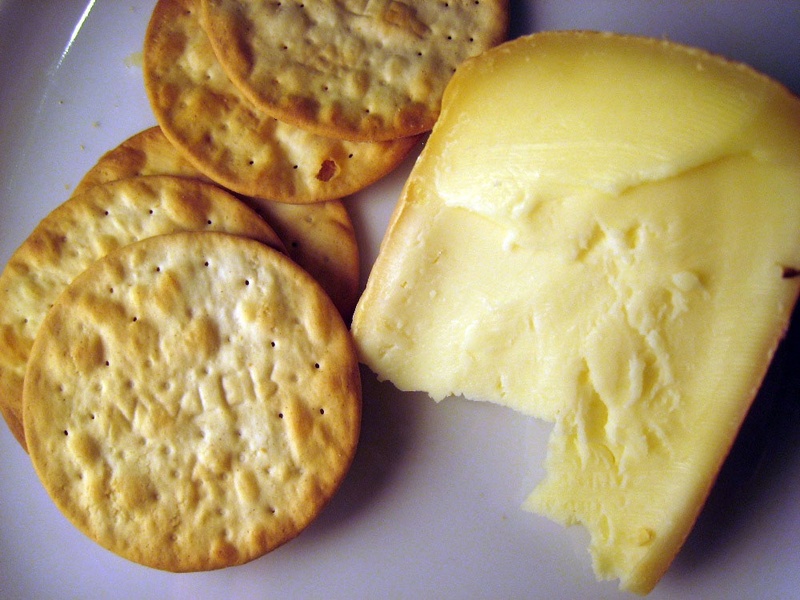 You might also like Taleggio (without the rind), Reblochon, or Morbier. A yellow or orange rind, especially if it looks softer rather than rock-hard, is almost always a telltale sign of a washed-rind cheese, and will thus be stinky, if only on the rind, and can be anything from mild and buttery to beefy and salty in the paste. I personally feel that eating Raclette cold is a waste of Raclette! The only way to eat it is to melt it! It is the most delicious cheese on the planet when melted. It also loses the unpleasant smell. @ToE . . . THANK YOU, and you are so right on. BUT, be careful with the microwave oven, the cheese really appreciates a “slow-melt” with a Raclette-heater-server. “Nuking” it can destroy the suble nuances inherent in the chemistry of the product. When melted properly, Raclette is the most culinarily-orgasmic taste treat on the planet. But way too many neophyte cheese “wannabe aficionados” do not handle Raclette properly. I will look for this cheese and try it out with a slow melt. I love hearing about all the cheeses you find. You definitely need to write more blogs about cheese. Where is the Fairway store? Does anyone know where to buy Racletter cheese in NYC?? thanks! Here are some Fairway locations. If you can’t find it there, try Murray’s Cheese shop at 254 Bleecker St. (between 6th & 7th Ave.). They usually have everything. Happy holidays!